Often when there are delivery pressures or fires to fight, the retrospectives can feel administrative and are often overlooked, which is a real problem as they are invaluable for continuous improvement. Are there any particular topics/issues that are present that the retrospective should focus on. Are the problems within the teams control to resolve and how to approach these. How can we get to the root cause and do it in a way which is fun and interactive for the team, so that they want to be there and to want improve together. Will any of the approaches taken be uncomfortable for any of the team members. The third point is especially vital in my opinion. With retrospectives occurring at the end of each sprint, they can easily become repetitive and boring. Making them fun increases the level of engagement and can really go along way to using the session for the team to improve. With a mixed group, it’s not always easy to find ways which will work for the groups personality. I try and find themes where everyone will get involved without alienating anyone. This can be difficult to identify with new teams as there needs to be trust between the team members to relax and explore ideas and vulnerabilities. That said, I thought I’d share my most recent retrospective here with the hope to share my experience and get your feedback. A while back I used ‘The Cool Wall Retrospective’ taken from the popular series Top Gear, and enjoyed the format with the team. I thought I’d revisit it and incorporate the car theme a little more. To help set the scene I asked each team member to send me at least one photo of themselves driving a car or at least in a photo with themselves and a car. This would help me set the mood and have some fun. Before the team entered the retrospective room, I had printed out all the photo’s I had collected along with some other photo’s such as ‘The Stig’ and other ‘Top Gear’ related images just to help set the mood. I divided the wall into the relevant sections and scattered everybody’s images around the room to create a theme. I put a couple of random car images in for good measure. I also pre-printed some voting cards for the Cool Wall section. When the team entered the room they were having fun looking at each others photo’s and discussing the stories behind them. This created a positive mood and relaxed the team ready to start the session. I then gave an overview of the retrospective structure and stated the approximate time for each. This helped keep focus and pace and it was referred to throughout the session. 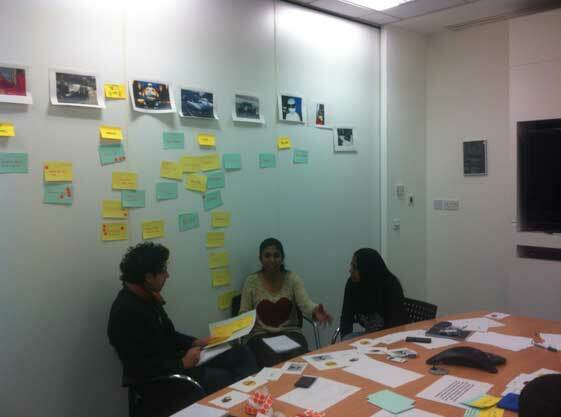 I like having an abstracted scenario to get the team thinking and discussing themselves and the previous sprint. Abstracting this gets the brain geared up for some lateral thinking. Sometimes I show short video clips and ask the team how the clip relates to the previous sprint. However for this retrospective I decided to ask a few ‘Check In’ questions instead, to get them thinking. In one word describe the previous sprint ? In one word whats on your mind ? In one word what do you want from this retrospective? Right now what car best describes you and why ? Each person then read out their answers to the rest of the team. There were some interesting answers to question 4, which also created a few laughs. The idea is that the better you are at something, the cooler it is and vice versa. Therefore on our 4 columns, you would be really good at something if it was within ‘Sub-Zero’. I selected a card from the pre-written pile and the team would vote using the cards provided to them. I then place the card in the column the team voted on. If there was a divide of opinion within the team, we would have a quick debate and then re-vote. After completing the cards I asked the team if they wanted to write any cards and get to the team to vote. After all the cards were placed on the wall it visually presents a picture what the team feel they are strongest at and which areas may need some work. This was a fun way to generate insights and really engaged the participants. Everybody had 2 stickers to place on the cards which they feel are most important to improve. This highlighted the top 6 issues to discuss. We then split into 2 teams of 3 and then each team selected one of the 6 cards in turn until each team had 3 cards each. I briefed the team on the 5 Whys technique and then asked then to carry this out on each of the cards until they feel they found the root cause. After both teams had completed their analysis of each card or if the time expired, they then explained their findings to the other team. This game, introduced by Diana Larsen, is used to efficiently form high-quality plans through retrospective analysis by recognizing factors that are within the team’s control. During retrospective activities, it is easy to hit a wall of unproductive blame. The moment the group reaches this barrier, “someone shoulds” and “if only you coulds” bounce around the room, knocking out any practical ideas for future advancement. Before determining what you can improve, you must first be clear on the dimensions you are able to regulate and what you need to adapt to. By identifying factors your team can control, influence, or cannot change, you can collectively discover how to respond to and overcome various situations. Ask your players to write their ideas for each circle on sticky notes. Once finished, ask them to post their notes into the respective circles. As a group, collaborate to identify how each idea can be used to improve your project. Encourage team members to expand on their ideas in order to further develop potential plans. A neutral facilitator is recommended to keep the activity from becoming too emotional. Evaluating negative aspects of your project is a sensitive but necessary exercise, and can leave people feeling upset or hopeless. Avoid any discussions about blaming people or wishing something would happen. This frame of mind places the control out of the team’s hands: both halting all forward motion and creating a negative environment. Keep the atmosphere fun and enjoyable so people will feel comfortable sharing their ideas. Negative self-evaluating activities often end up emotional and unproductive. Take advantage of this game’s visual organization and extensive collaboration to avoid the blame and hopelessness that cover-up ideas for future improvement. By identifying factors your team can control, influence, or cannot change, you can collectively discover how to respond to and overcome various situations. Play Circles and Soup to determine what you can do to avoid barriers and gain insight on what actions will most effectively enhance your project. After successfully identifying actions that were in the teams control or where an action can influence other, the team then spot voted. The top 3 actions were then extracted and moved into the next sprint with everyones agreement. When the team were happy with their committed actions, we summarised the session and answered any further questions. Was the session constructive and engaging ? Did the team get value out of the session ? Have we identified actions we can tackle to improve the team ? I personally use this feedback to gauge what worked and what didn’t which is helpful to know what to improve on moving forward. Overall I found this session to be rewarding and valuable to the team. It was fun, the energy level was high and most of all we identified ways to improve as a team with tangible actions to work with. If you would like to feedback ideas on the above or ask questions about the session, please feel free to comment below.